Free daily hot breakfasts and afternoon receptions with snacks and unlimited alcoholic/non-alcoholic drinks for up to 6 people in your suite. Complimentary parking and fitness room. For online reservation click here. To register by phone please call 407-239-1144 and ask for the reservation. 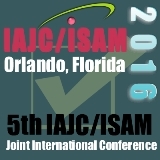 Please mention International Association of Journals and Conferences to receive the discounted rate. Discover many things to do surrounding our Kissimmee hotel near Disney. Click Here! Copyright 2013-2018 IAJC. All Rights Reserved.